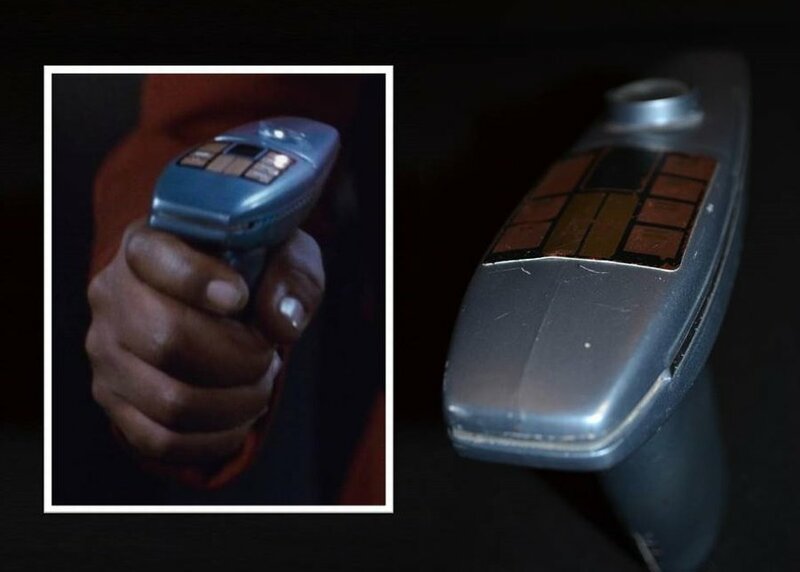 30 year old rare Starfleet Phaser from the 1984 movie 'The Wrath of Khan'. Please note this piece has sustained some damage to the underside. Please read condition report below and see detailed photographs. 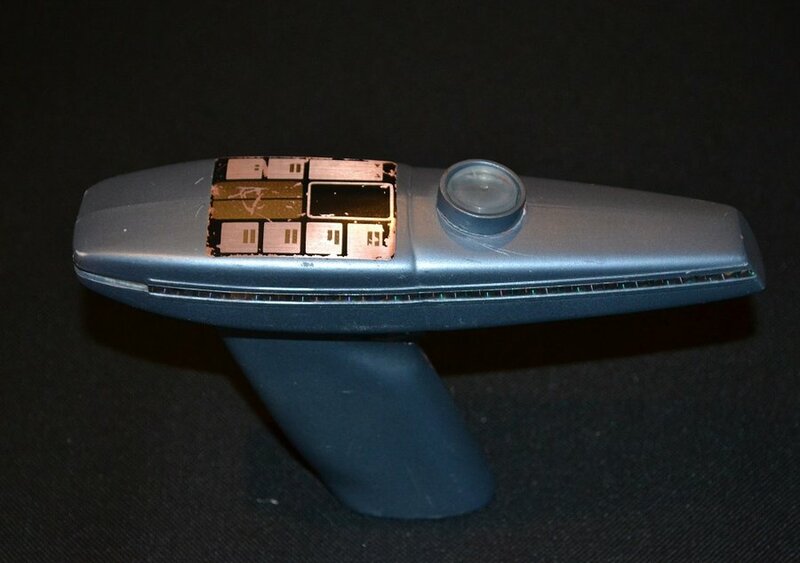 Any piece from The Wrath of Khan is incredibly rare and this phaser is no exception. 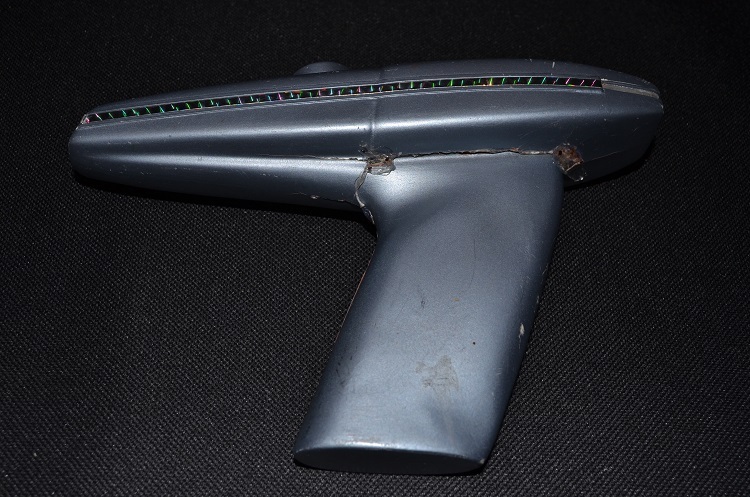 This specimen is a background version constructed of lightweight vacuum-formed plastic and is painted a blue-grey finish with tan button appliqué that was unique to WOK Phasers. 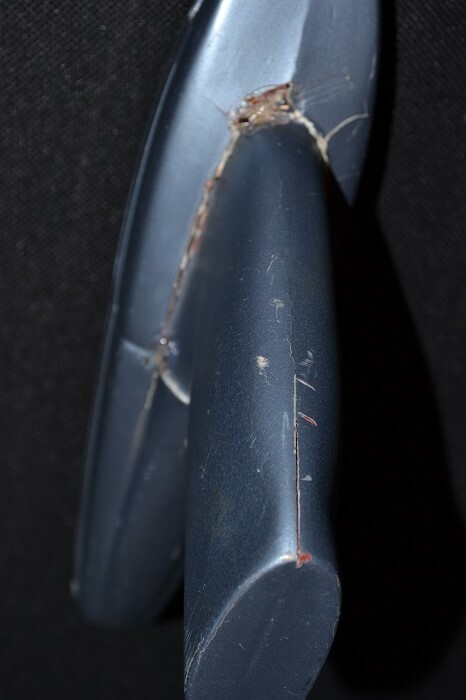 Due to the relative fragility of these pieces few have survived making this prop a truly hard-to-find phaser. 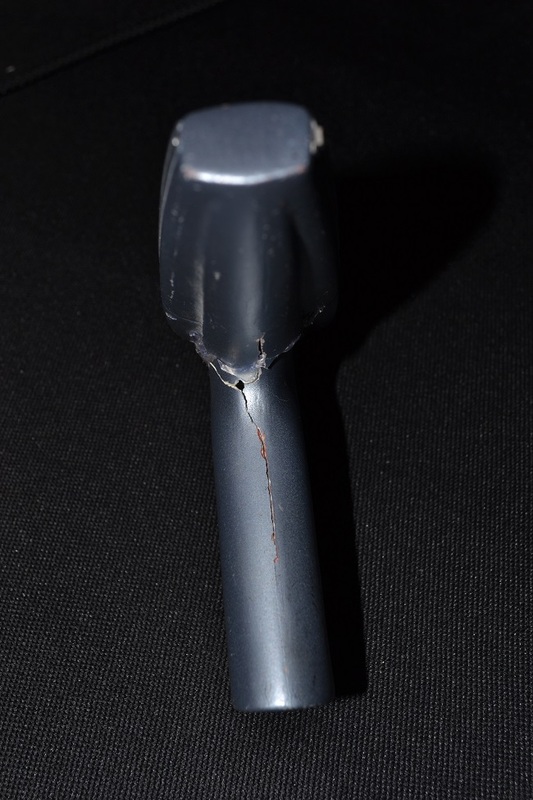 The damage to the underside is primarily around the top of the handle and the seam running down the centre of the handle has started to part. 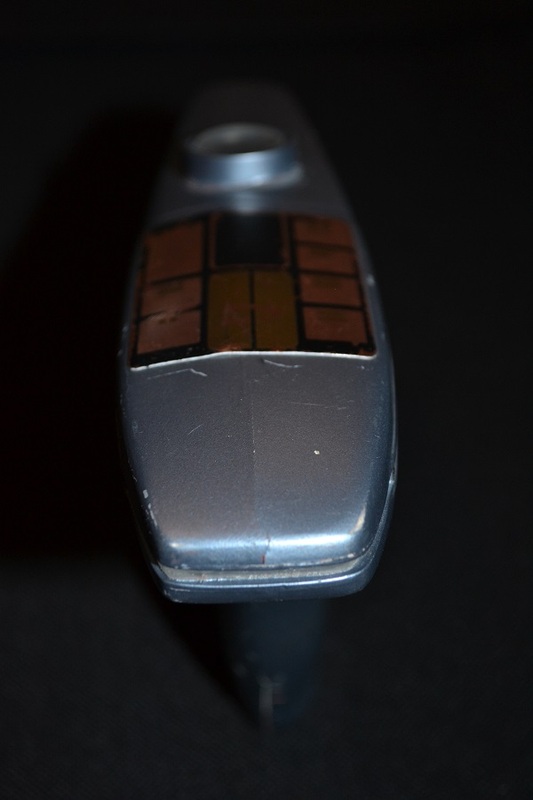 An attempt by the vendor has been made to superglue some of the damage however this has been very poorly completed. The glue needs removing now in order to repair this phaser. From the top the damage is not visible. From the side and in its normal display standing position much of the damage is not visible. . The rest of this item shows a number of marks and has some fading to the 'light panel aplique' which is consistent with production use and age. 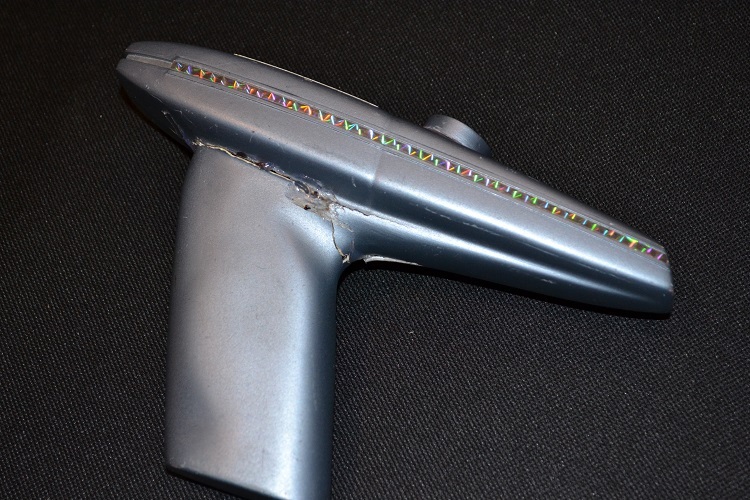 In our opinion with some TLC or professional help this items appearance could be significantly improved to the extent that a well executed repair would return this piece to a Wrath of Khan phaser to be proud of. We sold a good condition sister piece to this phaser last year for £2,550 ($3,900) and have reduced the price of this phaser by more than 50% to reflect its condition and allow the purchaser to complete a high quality repair. 1) This Phaser Pistol and all the items in this collection were originally obtained from a named Star Trek prop master with written provenance held on our files. Full details will be included in your certificate of authenticity. 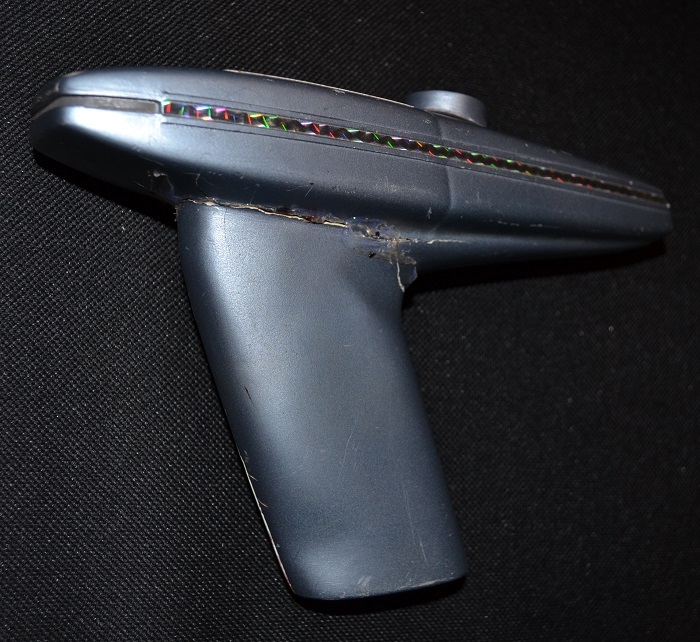 2) We have also shared detailed images of this piece with an expert, Don Hillenbrand, a respected collector of genuine Star Trek props and owner of the website www.wrathofdhan.com He has confirmed that this is an authentic Star Trek prop and is correctly described above. Further details can be found by following the link below.